Ekar, a Dubai-based company set up through CREATIVE ZONE, is the first and fastest-growing pay-as-you-go ‘carshare’ operator in the Middle East. Ekar uses a smart access technology on instant car bookings and reservations via the ekar app. By just downloading the app and going through the usual user registration, people can now easily book and drive a car anywhere in the UAE. Ekar Founder, Vilhelm Hedberg, recognised a gap in the shared mobility industry in the Middle East at a time when car-sharing was already commonplace in Europe and US. He saw a niche and decided to bring the concept to the UAE. Driven by his passion for business startup and investment, Vilhelm introduced ekar to the UAE in 2016. In only less than two years of operation, ekar has gained a positive response from the public as a sustainable alternative to car ownership. Ekar’s solved some basic consumer challenges with car ownership namely, the hassle and pressure of car loans, insurance, plus costly maintenance. Ekar started its ground base operation in 2017 by partnering with the Road Transportation Authority (RTA), Emirates Airlines, and Etihad Airways, which was initially targeted to cabin crews who have relatively short stays in the country. Since then, ekar’s carshare demographics have grown considerably, boasting more than 100, 000 app downloads and 40,000 user-base. The ekar philosophy is it enhances the customer experience and provides options to suit all customers, and consequently has expanded the fleet to include premium cars like Volkswagen, Mini Cooper, Inifiniti, and Nissan. Ekar keeps evolving and growing each month. Today, ekar’s operation has reached the Kingdom of Saudi Arabia (KSA)—the first car-sharing operator in KSA—in partnership with Saudi Aramco. By the end of 2018, ekar is planning to add more vehicles throughout the MENA region. Vilhelm credits CREATIVE ZONE for assisting him through the legal process of growing his business, particularly the transition from Free Zone trade license to a Dubai Mainland company. In the process of scaling up, Vilhelm believes in having enough capital in store to support the building of strong business components and human resources. From having only three employees in 2016, ekar will welcome over a hundred employees by the end of 2018; therefore, his careful planning has produced positive results. As an entrepreneur, Vilhelm’s goals and motivations have changed over the years. His plans for the future of ekar and his idea of scaling up a business speaks boldly of himself as a visionary who embraces learning and growth, both personally and in business. In this video, he shares some of his greatest lessons, his challenges, and some key advice that he hopes will inspire budding entrepreneurs. 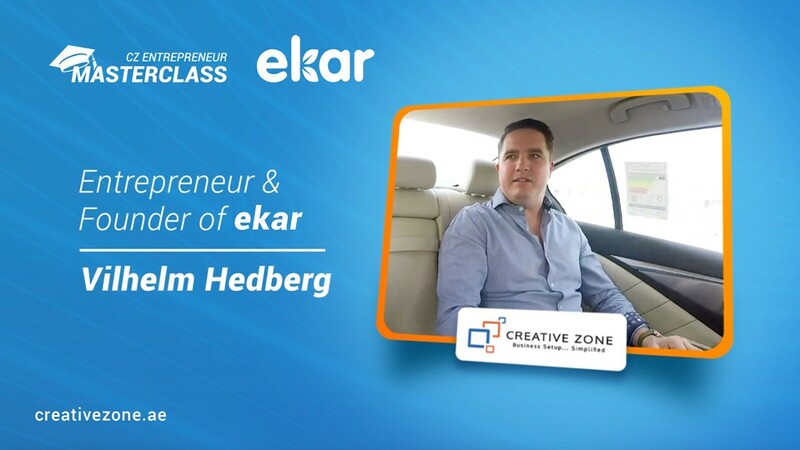 Register to access the third segment of CZ Entrepreneur Masterclass featuring ekar Founder, Vilhelm Hedberg.